Dimapur, May 11 : A delegation of the Northeast Students Organization (NESO), which has been camping in New Delhi since May 6 to apprise the central leaders on the burning issues confronting the people of the region, has met the Prime Minister, Dr Manmohan Singh on May 8 and submitted a memorandum. According to a press note from the NESO, the delegation had an in-depth deliberation on the various issues affecting the region. The NESO delegation also called on the Leader of Opposition, Lok Sabha, Sushma Swaraj; BJP President, Rajnath Singh; Congress Vice President, Rahul Gandhi; Election Commissioner of India, HS Brahma and the office bearers of the North East MPs Forum. According to the press note from the NESO, the issues discussed included education policy and human resource development; repeal of impunitive legislations and the need to expedite the ongoing peace process for an early negotiated settlement; infiltration of illegal migrants, refugees and demand for a comprehensive policy thereof. Other issues raised were economic and infrastructural development; employment policy for NE; Indo-Bangla land swap deal 2011 and stapled Visa; special constitutional status and separate time zone for NE region and restructuring of the Ministry of DoNER. The NESO has informed through its Chairman Samuel B Jyrwa and Secretary General Sinam Prakash on the outcome of the deliberation with the central leaders. On the education policy and HRD, NESO urged the PM to set up a Special Educational Commission in order to assess the state of education in the NE and to evolve a suitable and appropriate educational policy which is relevant to the people. The NESO pointed out that thousands of students have no option and are compelled to seek better education in mainland India. The PM gave a patient hearing and assured to look into the matter. The NESO has urged the PM to repeal the AFSPA, 1958 and other “inhuman laws,” and to expedite the ongoing peace process for an early negotiated settlement. NESO asked the PM that if the government can send a parliamentary team to Jammu & Kashmir, why not a similar initiative can be taken for the NE region. The PM responded in the affirmative, the NESO stated. On the ongoing peace process, the PM asserted that for the last nine years, he had taken personal initiative to bring about a negotiated settlement at the earliest in order to restore peace in the region. NESO also pointed out to the problem of influx of illegal migrants/foreigners and refugees besides enrolment of illegal foreigners in the electoral roll. The PM was urged to take steps towards deleting such illegal entries and deporting them. NESO also pointed out that the National Register of Citizens, 1951 should be updated. Moreover, NESO urged the PM for effective implementation of Assam and Manipur accord. The PM was also urged to evolve a sustainable economic policy for the NE region and to stop construction of mega dams in the region keeping in view the seismic sensitivity and to declare floods and problems of erosion in the NE region as national problems. The PM agreed to the viewpoint of the NESO on this matter. On employment policy for the NE, the NESO delegation stressed on the need to have an employment policy for the indigenous peoples of NE whereby a 100% reservation in Grade III & IV is needed to be reserved in all the Central government offices located in the region. On Indo-Bangla land swap deal 2011, NESO while expressing concern for the indigenous communities, asserted that this should be scraped in order to protect the land of the people. 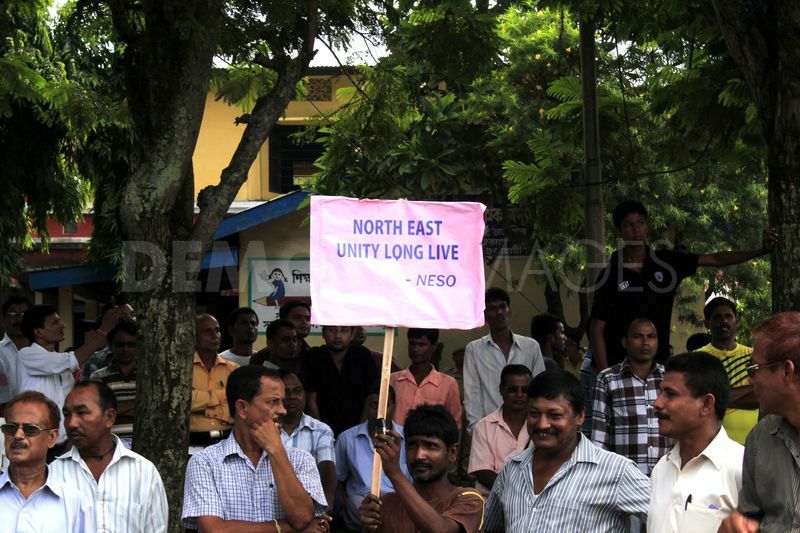 On special constitutional status, NESO urged the PM to grant a Special Constitutional Status for the people of the NE region in order to delegate greater federal authority to the State governments including the rights over land and its natural resources. According to the NESO, the PM explained that the NE region has a special status and that special packages meant solely for the region exists. However he assured more for advance development of the region. The NESO also demanded to the PM not to dissolve the DoNER Ministry and instead urged for its restructuring. The PM assured that DoNER will not be dissolved and that the Ministry will be strengthened so as to boost economic development in the region.